New Home! Ocean view, awesome people watching, awesome beach access, close to it all. Quiet at night and fun in the day! New Home! People watching, ocean views and enjoying ocean breezes are the only thing you will be thinking about while staying here! Steps to the Tybee's Popular South End Beach!! 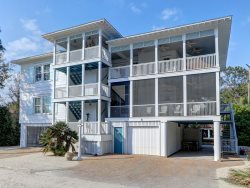 Ocean View Tybee Island Condo with Pool Access! Perfect for your family beach vacation! Relax and Enjoy Your Beach Vacation! This Cozy Condo is Located a Block From Tybee's Most Popular Beach! Great beachside affordable family home 100 feet to the beach!